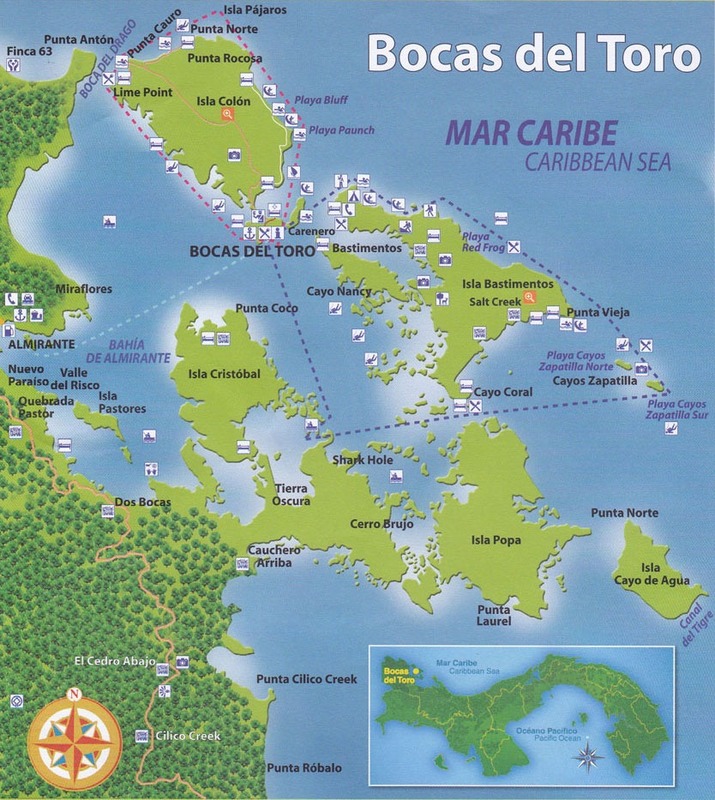 Bocas is an island archipelago on the Carribbean (northern) coast of Panama. It’s a three-hour drive from Boquete through an incredibly scenic mountain range (think Switzerland, only tropical), but culturally it’s a world apart. Everything about Bocas reflects this: the breezy architecture, the Afro-Caribbean heritage of so many of the people, and the brilliant splashes of color everywhere you look. Although Spanish is of course the dominant language, many of the islanders also speak a dialect called guari-guari that has elements of Creole English and Spanish, mixed in with the language of the local Ngöbe Buglé indigeneous people (Bocas del Toro province borders the Ngöbe Buglé comarca). To us, it sounded vaguely Jamaican/Belizian. We’ve wanted to visit Bocas since our sailing days, when many of our cruising friends made the voyage up from Panama City and spent idyllic weeks at anchor among the sun-drenched, palm-fringed islands. We never made it on our boat, but over Hallowe’en weekend we crossed the mountains with our friends Bond and Luana. We even got a boat “fix” when we were able to visit the catamaran of our friends and former landlords Jules and Jon, who are living the life at anchor off Isla Bastimentos. We apologize in advance for so many pictures, but we were knocked out by the color, scenery, and people of Bocas and just couldn’t decide which ones to cull! Catching the water taxi at the banana port of Almirante. After a three-hour drive, it’s about another 45 minutes to Bocas town via water taxi. We made it to Bocas Town! The afternoon flight arrives at Bocas airport. I feel a Jimmy Buffet song coming on! Carved from a single giant tree, this dugout canoe is the biggest we’ve ever seen! Bike shop, Bocas Town. Everything moves at a slower pace here. We couldn’t get enough of the colorful water taxis. John has a girl in every port! S/V Sea Feather. We remembered this boat well from our cruising days. We were suprised to see it anchored at Bocas, with a new owner. Guest cabins off Isla Bastimentos. Think we’ll stay here next time! Great pictures. Thanks for wetting our whistle for more Panama adventures. Can’t wait to come back again. Wonderful account of your trip! We can’t wait to go! On another topic, my husband is in Boquete getting set up and ready for me (and our dog). Is there a way to reach you to ask questions regarding your move, with your dogs? We will be coming from San Jose, California on Copa at the end of January. We don’t want to bother you too much. Let me know if there is a way for you and my husband to meet up. Really lovely photos and I can see how magical it is! Thank you!! Glad you liked the pics. Hey Guys, Thanks so much for the great post. Sure brought back memories of our 10 month stay in Bocas. We actually bought property there on Isla Pastores (3.5 hectors) on the South end. We closed on it about 3wks before we left the area and sold it for double our purchase price while at anchor at San Andres. Again, great memories. Keep all those pics and stories coming. We still have so many fond memories of the good times on El Regalo and with you and Teresa. If you ever think you’d like to come back down here, you have a place to stay! Just what we needed, another bucket list item! Thanks, you two. Can’t wait to visit Bocas del Toro. Gotta move to Panama first, then onward. Hey, if you read this soon, we have questions about the Pensionado Visa. Get back to us? Thx. Hey there – we have not gotten our pensionados yet ourselves but we’ll tell you what we know! There are basically two types of residency visas available to us (your mileage may vary) – the pensionado and the Friendly Nation. We could apply for and get Friendly Nations visas now but they’re much more expensive than the pensionado. Therefore, we’ve decided to wait until John starts collecting social security in just under two years. Until then, we’ll be making border runs to Costa Rica every three months (see our blog posts about that). You need a lawyer for visa work. We have a good one, Lourdes Miranda, whom we gladly recommend. Basically, it’s a pretty involved process that takes several weeks and lots of paperwork. To qualify for the pensionado you need to have at least applied to start receiving social security, or some other government or private company pension. Retirement savings don’t count. I think the minimum amount of pension income you have to show (per couple) is $1,200, but I’m not too sure about that. If you’re from the U.S., you also have to have an FBI background check (not sure what the requirements for Canada are). We know lots of people that started the visa process before they even moved here. Our advice is to wait – you might want to get your feet on the ground first and live here a few months just to make sure Panama’s right for you before you go to the time and expense of getting a visa.